This honey mustard pork tenderloin is an easy recipe and the slow cooker makes cooking a breeze. 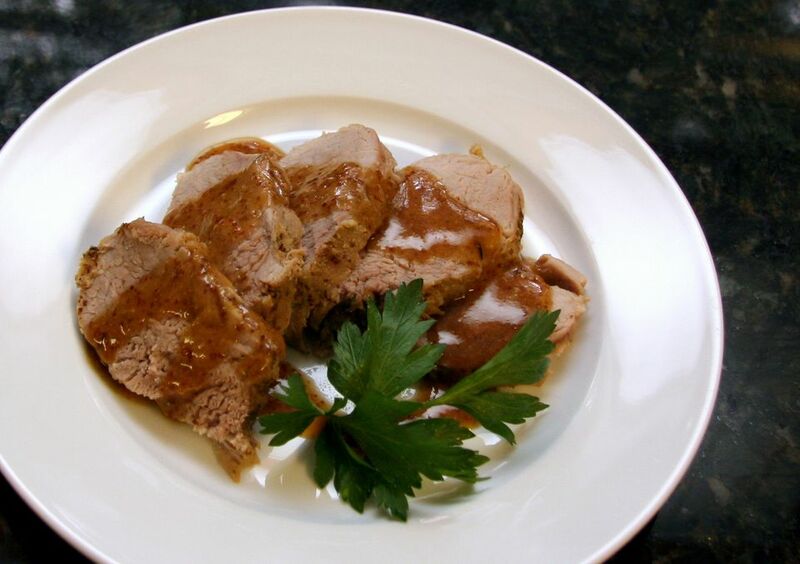 The pork tenderloin is combined with a variety of simple seasonings and a sweet-sour sauce made with honey, mustard, brown sugar and some balsamic or cider vinegar. Serve the lean and tasty pork tenderloin with rice or roasted potatoes along with your family's favorite side dish or salad. Newer slow cookers tend to cook hotter than older models. If you have an older model, you might want to increase the cooking time. This lean cut of pork can become dry if cooked too long. Trim the pork and pat dry with paper towels. Sprinkle the pork tenderloins lightly with salt and pepper. In a small bowl, combine garlic, mustard, honey, brown sugar, vinegar, and thyme. Pour the mixture pour over the pork. Turn the tenderloins to coat thoroughly. Cover the pot and cook on low for about 5 to 7 hours, or on high for about 2 1/2 to 3 1/2 hours. Remove the pork tenderloins to a plate; cover with foil and keep warm. Pour the liquids into a saucepan and bring them to a boil over high heat. Reduce the heat to medium and boil for about 3 to 5 minutes, or until reduced by about one-third. Combine the cornstarch and cold water; stir until smooth. Whisk the mixture into the reduced juices and cook for 1 minute longer, or until thickened. Serve pork sliced with the thickened sauce along with rice or potatoes and steamed vegetables. Slice a medium onion and scatter the slices over the bottom of the slow cooker before you add the pork tenderloins. Use a sharp knife. Slip the tip of the knife under the silver skin about 1 inch from the end of it. Grasp the loose skin—a paper towel in hand will help keep the skin from slipping—as you slide the knife down the tenderloin, taking care not to cut the meat.